A Double Sided Wire Mesh Basket Display is a great opportunity to take the items you have and showcase them in a whole new way. 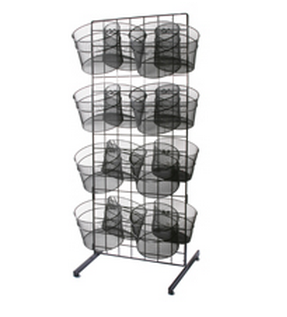 You will receive sixteen 11inch diameter wire mesh baskets along with the grid hooks to easily attach to the floor fixture. Choose a different direction with this new double sided display piece, which features a sturdy metal design and powder coated steel for a finish you cannot miss. This double sided display has 8 baskets on each side giving you a grand total of 16 display spots to fill as you wish. Whether you fill with small novelty items, toys, candy or even fruits and veggies, customers will be checking to see what you have. 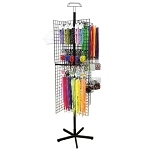 Go ahead and add a wire basket display or two into your shopping cart today at Candy Concepts Inc. and fill with a variety of merchandise.